So I've had a Mint floor cleaning robot for a long time, which is essentially a very smart Swiffer. 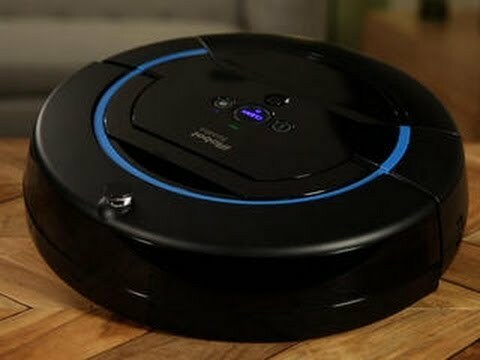 I'd been wanting to try one of the newer Roomba style robots and was thrilled to get the opportunity to review this new Scooba 450. I'll go through some things you should consider when buying a floor cleaning robot, and how the Scooba stacks up. Yes it is. I mean, not rock concert loud, not even vacuum cleaner loud, but it makes a bit of a ruckus. 2) What types of floors does it clean? It mops and vacuums, so pretty much any hard floor. I tried it on a vinyl kitchen floor, a tile bathroom floor, and several hardwood floors. It did a great job on each. 3) Does it get stuck a lot? No, and on the rare occasions it did, it signaled to me with a sound, and when I pushed the information button it told me "I'm stuck" in a cute voice. 4) How's the battery life? It charges fairly quickly (but do a long charge the first time before using it) and will last for a couple average sized rooms before wanting to recharge. 5) So uh, does it like, clean floors? Yup. I let my floors get pretty bad, but it did a great job of cleaning. There were a few small wet dust bunny clumps left behind, but it got 98% of what was on the floor. 6) Is it a pain to clean? You need to empty and rinse the water tank and rinse the scrubby brush assembly after each room. This is very easy, just rinse in the sink. The water tank will probably dump out some dust bunny clumps. Toss them in the garbage. Not a big deal. 7) But . . . is it worth the price? This little monster is pricey, no doubt, but if you hate cleaning floors as much as I do, it's worth it. It's well built, the programming is smart, it really gets the floor clean, and can be run with just plain tap water, or you can add a little of the included cleaning fluid if you like. It has a little invisible barrier unit that comes with so you can prevent it wandering into another room. It has everything you need. I've had 2 Scoobas before this one, starting with the 5900 series, upgrading to the 300 series and now this one. This is a dramatic departure from what I'm used to in some good ways and some bad. I like it-- but with some caveats. I'm also a devoted Roomba user, currently having a 650. I started way back with the Roomba Red that I bought on Amazon way back on Feb 23, 2007. I've been a long term customer of the robot vacuums. Unpacking the unit, the first thing I noticed was that this design was drastically different than what I've been using for the last several years. It looks like they stopped making a separate body style for the Scoobas, and consolidated on a single design. This one is very much designed just like the Roomba, replacing the dirt bin with the water tank. This also means that cleaning of the Scooba itself is easier, and the brush scrubber area where the scrubbing takes place removes much easier for rinsing than the previous models. This model also has more useful symbol/light feedback on the top of the unit. There is a dedicated info button that can give you current status, as well there is more visual feedback as to the status of the cycle (lights that build until complete) and more feedback in the status color of the battery as it charges. Charging is fast and easy, filling is easy, and overall maintenance and use seems simpler than the previous models. The quick start guide had only images and it was fantastically well thought out. This model offers a lot more voice prompts to tell you what is going on and if it needs help, what it needs-- dirty water full, can't detect water bin, needs charged, done, etc. Turning the device on for the first time, it has the option to choose small or large room size. This is also an improvement over previous models. I started the cleaning cycle and ZOOM! This thing races across the floor, easily double the speed of my previous model. As it raced across the floor I was initially concerned that something was wrong. The squeegee is so effective that I thought it wasn't properly putting down the cleaning liquid. A test with my hand confirmed that it was damp, so I know it was cleaning. A couple other things: I don't prefer that this one has no dedicated error voice or code when it's stuck and needs restarted. All past Roombas and Scoobas would give a real tone that you can recognize when it needs assistance. I was finding it silent thinking it must be done, but nothing. It did a good job cleaning, and I have a challenging floor-- a wood floor so old that the nails that hold it down are square head hand-forged nails. The floor doesn't look uneven, but for a robot it can be a challenge. While many of the challenges it posed to my old Scooba were gone due to new functionality of this model, this model brought me some new challenges. This unit was a little bit more willing to hop up on my rugs than the previous model. They are very thin rugs. Most of them I take up anyway to clean under, but I have one under an antique coffee table that is oak, heavy, and difficult to move off of the rug. As well, this model is a bit more stubborn at times. The old model would let me end a cycle if I was satisfied that the floor had been adequately cleaned & dried. This one won't do so (so far as I can tell). I have a tiny bathroom with hard floor that I usually clean second after my main floor. The battery was still good, so I shut it off, emptied dirty water, refilled clean water and moved to the second room. I turn it on, press go.. oops! It wants to do more drying. I turn it off, back on again, oops! It still wants to dry. Ok. I let it finish it's stubborn tirade. I turn it back on when complete to clean this 3'x6' bathroom, and NOPE! It demands to be emptied and charged. Okay. I give up. :) I'll look into whether there is a way to tell it that I want it to move on from its last assignment. To be honest, I went through a lot of batteries in my previous Scooba. I didn't use it daily or even weekly, and I know it is good to keep charging and using batteries. Maybe this unit is keeping me from ruining the battery, but the inflexibility combined with the rug hopping caused me to ding it a star. There are two things that I like a lot about this new model-- first being that the entire mechanisms where water flows are removable and rinseable. The old model had some water channels and vacuum channels made through the unit which could build up with floor mud and lint and would need removed and cleaned. This model has a smarter design that simplifies and makes parts that could clog removable. Bravo on that design improvement. The second part that I really like is the improvements in navigation-- this unit is far smarter and even has some reverse intelligence to work its way back from things it is trying to clean around, navigate around, etc. It is far more deft on its feet, or wheels as it happens to be. I also get the perception that this unit uses a lot less water than the previous unit, while doing the same quality job of cleaning, and with a far higher speed RPM brush. The water bin seems to hold a lot less water, but doesn't seem to run out before the cleaning job is done. In the end I'd say this is good. The old model could really slop a lot of water on the floor, and for those of us that have a traditional wood floor, it would absorb a lot of that water and change the way the floor looked. I experienced much last of this issue with this model. This model is a definite move forward from my previous model, and faced with the choice I would certainly choose this one. While it moved forward dramatically in many ways, it moved back in a couple, at least in the ways that I use the unit. As I use it more I will update the review if my experience or conclusions change. If you have any particular questions please feel free to ask them in the comments. I will do my best to respond to you ASAP, even if I don't have the answer right away.